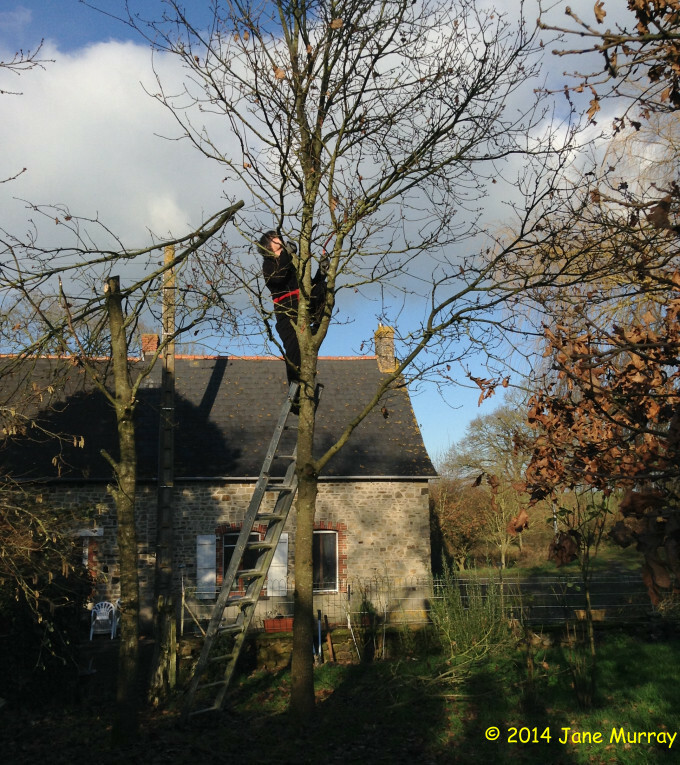 I spent part of this afternoon lopping the tops off of two oak trees. The intention is to have them grow to be "lollipop" shape, as they're too close together and close to the house to turn into great majestic oaks. I couldn't help but hum to myself the tune I am a linesman for the county (Glen Campbell, I think). I watched the most recent series of Doctor Who. I watched it while facepalming harder and harder. Some of the ideas were good, don't get me wrong, but the delivery wasn't. But it wasn't just that, it was Peter Capaldi and Jenna Coleman... what's the word? They didn't seem to "gel". It was a blast, the previous series. With Matt as the Doctor, Clara (The Impossible Girl) and the bloke in the blue box got along so well that we didn't spend forever mourning the loss of Amy Pond. Then the Doctor regenerated. Into an old guy. An old guy with a young bouncy sidekick and some excruciating dialogue to have to deliver. You see, in their own way, the Doctors have made the role their own. The huge scarf, the daft-looking private school cricket outfit, the fez, the bow tie. Not only have these items of clothing been like a metaphor for each of the Doctors, they also took to the eccentric weirdness of it. Even the Northern bloke that you expected to step out of the Tardis with a rifle over each shoulder. They made the role their own. And they made themselves The Doctor. Has Capaldi? I'm just not feeling it. So with dread in my heart, I sat down to watch the Christmas Special. Containing Santa (played by an appropriately named Nick Frost) and a bunch of people stuck on a base at The North Pole. Cliché upon cliché there. It's going to be Who-style Invasion Of The Body Snatchers, right? Actually, it was really good. Not the best (Are You My Mummy?) but head and shoulders above the rest of the season. The ideas were not new, it was Aliens mixed with Inception mixed with Inception with a pile of subtle in-jokes to keep it from veering into narmy horror. The basic premise was that face-hugging alien crab thingies would fall on you, hug your face (clue in the name, eh? ), poke a hole in your head and start to dissolve your brain. In order to stop you from freaking out over your impending death, the crabs would inject dreams into your head. You'd think everything was just fine as the dream would be your reality. Waking up was the hard part. Actually waking up was the harder part. Along the way, Jenna Coleman who has shown off her acting abilities by practically being a different character each week, gave us two very different Claras. The one we all know, and an old Clara. The old Clara was sublime. Played delicately, without a fake croaky old-person voice, but in an entirely believable way. The Doctor... got to talk a lot. No change there. Shona, taking her mind off of the creatures in the medical room with some improvised dancing to Slade. FATHER CHRISTMAS - unbelievably well played by Nick Frost, best character of the show. "There are 526,403,012 children all expecting presents before tomorrow morning. So, that's 22 million children per hour! It's impossible! Obviously, I've got a second sledge." "I can commit several million housebreaks in one night, dressed in a red suit with jingle bells. So of course I can get back into the infirmary." "How much more obvious do you want me to make it? Because I can text the Easter Bunny, you know." "This is your mind trying to tell you this isn't real. So it gives you me. Sweet Papa Chrimbo! It gives you comedy elves, flying reindeer. A time-travelling scientist dressed as a magician." ... you'll notice Sweet Papa Crimbo gets most of the good lines in a fairly effective horror-comedy, with some real creepy moments. The "You're dying" chalkboards in the hallway might seem like something from The Shining but it worked perfectly here, complete with an effective dolly zoom. New Writers. I'm not going to call for Moffat to shuffle away, but I think the writers need to assess what exactly Doctor Who is and work with that, and maybe bring in some fresh ideas. No Daleks, No Cybermen. No, seriously. Daleks are getting boring, and Cybermen with rocket legs? What were they, gag Cybermen? Foes are supposed to be scary. Those Angel statues, creepy. The Cybermen? Comic. You just can't feel for the impending doom when you are giggling. Shona. Maybe we should have "The Gobby One" for the next sidekick? Okay, she'll still be young but she won't take crap from The Doctor. Her character was great, only marred by Santa stealing practically every scene (even ones he wasn't in!). Missy. I don't know what Missy's deal was, exactly, but her manic scheming was pleasing to watch. Who cares if she was chewing the scenery? She was so over the top it made a perfect contrast to this somewhat uptight Doctor. Blow up Gallifrey and move on. You have no idea how relieved I was to see the Tardis doors open... and emptiness. We've done Gallifrey. We've done Trenzalore. Okay? The Impossible Girl. How and when did Clara get demoted from The Impossible Girl wandering around The Doctor's many timelines to being... a schoolteacher? For the love of <preferred deity>, please NO MORE DANNY PINK. Enough already. Here are two of the recent(ish) episodes that I enjoyed the most. "The Rings of Akhaten" - #234 season 7. Little girl, redemption in a single leaf, gorgeous visuals. Weakish ending, but still likeable. "Hide" - #235 season 7. On a dark and stormy night...unfolds a sublime gothic horror with monsters. "In the Forest of the Night" - a schoolgirl, Maebh, who is a kooky one, and an awful lot of trees that appeared overnight. A mixture of old fable and utter nonsense, the story completely fell apart when it was revealed that the trees are guardians of the planet who appear to create oxygen to buffer the Earth from the effects of a devastating solar flare. Uh... Yeah... Science teachers on multiple continents would have gone to school the next Monday with red hand prints across their faces. But, you know, much of season nine was... I felt it was weaker than the previous. Let's just leave it at that. 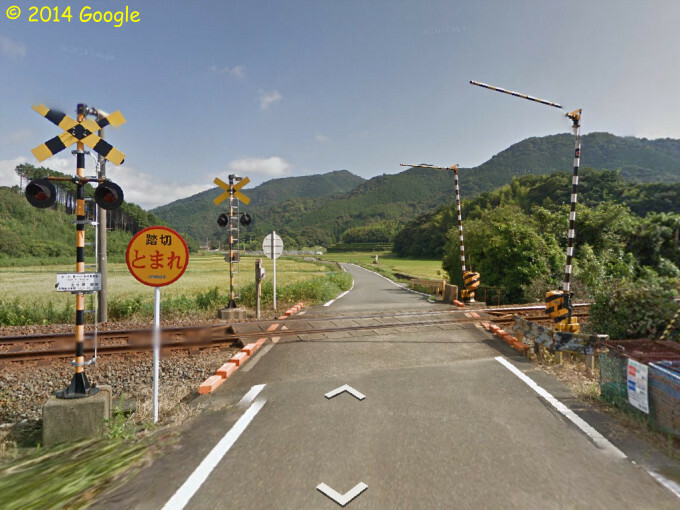 A railway line along the northern coast of Northern Yamaguchi, around Nagato. As you can see, it is perhaps even more rural than around here. No links to locations. I was bored and couldn't sleep so I wandered around Streetview on the iPad. There's enough above to find the railway. Have fun exploring. Wouldn't it be nice to walk along here on a summer's day? 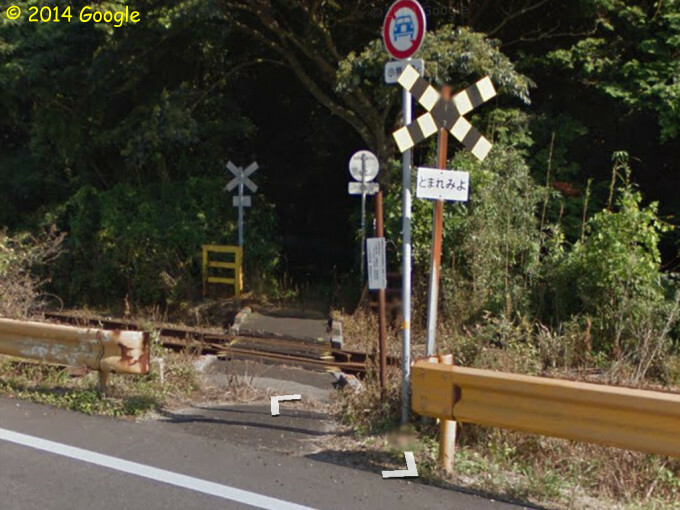 This must surely be up for the award of "tiniest railway crossing ever"? Calling this a "Main" line is surely tongue in cheek? 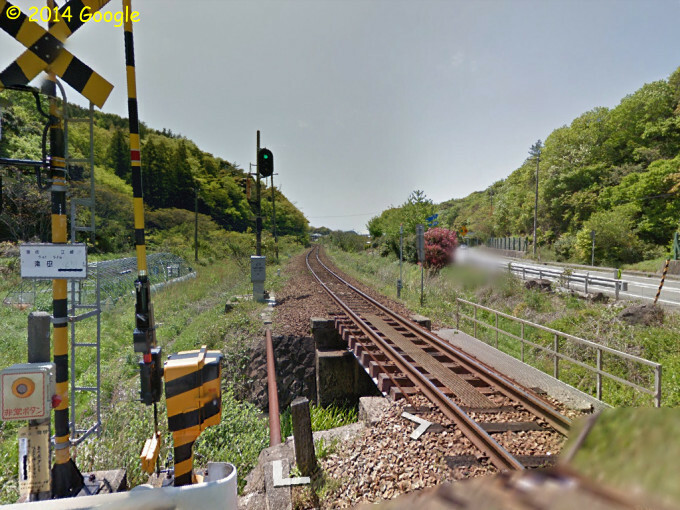 That said, by the time we get to Nagato, we are 560 km away from the start of the line in Kyoto. To put that into context, London to Cork or London to Glasgow. Paris to Montauban (just above Toulouse). Rome to Sarajevo... It's a fair long way, and a lot of this end of the line appears to be a single track line. IMO, Capaldi very much HAS made the Doctor his own, but it's perhaps not as obvious as you might think. As well as watching this season when it was broadcast, I recorded it, and had a binge watch over a couple of days after Christmas - the whole season, immediately followed by the Christmas special. I saw Capaldi's Doctor more/better that way than I did when watching the series the first time around - perhaps the week between each episode was less than helpful. As were some of the weaker episodes, like "Kill the Moon". Ugh. The age difference between the Doctor and companion is interesting, but not an issue - or it shouldn't be. Yes, Capaldi is 28 years older than Coleman, but consider that Hartnell was 32 years older than Carole Ann Ford. Okay, that's a bad example since she played his granddaughter - so how about Maureen O'Brien, who was 35 years younger than Hartnell. Or Pertwee and Katy Manning - only a hair's breadth away from the Capaldi/Coleman difference, at 27 years. Modern audiences have just grown accustomed to a narrower age gap (at least in part because they've become accustomed to a younger actor playing the Doctor). Flying Cybermen? If Stark can have jets in his Iron Man costume, why can't Cybermen fly the same way? I don't have a problem with that. Oh, and I hate to say it - but I suspect Danny Pink will return. We've met his grandson, so having killed him off the writers now need to fix the paradox they've created. Let's just hope that when they do, it's the better writers that deal with it.